Have you ever seen a jogger whizzing past you wearing a bright piece of tape strapped across their hamstring, shoulder blade, or shin? That’s not a fashion statement, that’s athletic tape. This type of rehabilitation product has been used by athletes and exercise enthusiasts for decades and continues to be a popular method of pain management. Advances in technology are allowing tapes to become more effective and beneficial to the wearer and are often recommended by sports doctors and physiotherapists. Athletic tape is an umbrella term for any athletic ribbon or bandage that’s strapped to a part of the body that has been injured or inflamed in some way. The strategic placement of the tape has been known to speed up healing and provide support to the injured area as it heals. Some tapes like Coban bandages, under tape, and rigid tape, provide different levels of support, breathability, and flexibility. The type of athletic tape that is undoubtedly gaining popularity is kinesiology tape. Developed in the early 1970s, kinesiology tape is completely flexible and manufactured to have the same feel of skin. Made of stretchy cotton material with a heat-activated adhesive, kinesiology tape is used by athletes to improve their performance and receive dynamic support for injured or inflamed joints and muscles. Unlike many other athletic taping methods, kinesiology tape can be worn for up to a week, which accelerates the healing process. – Kinesiology tape is known for its “lifting properties”, which reduces pressure on the painful area. – The unique tape allows the wearer to return to their sport or activity by relieving pain and supporting weak or fatigued muscles as they move. – The buildup of lactic acid in the muscle leads to painful cramping, strains, and delayed onset muscle soreness. Kinesiology tape reduces lactic acid in – that region to improve your performance and prevent muscle cramps from getting in the way of your activity. – Kinesiology tape provides neurological and physical support. It also stabilizes the muscles to prevent further injury. – Use only as directed: It’s easy to get excited about a non-invasive pain management product, especially if you’re a chronic sufferer. In order to get the maximum benefit from athletic tape, however, we suggest consulting with your physiotherapist first. Not only will they be able to determine if athletic tape is suitable for your injury, they will also be able to show how to wear it properly. – Make sure your skin is prepared for taping: it might be worthwhile to consider removing hair and taking care of cuts or lesions before applying the tape, especially kinesiology tape. – Learn about the proper tape removal methods before applying it to your skin. 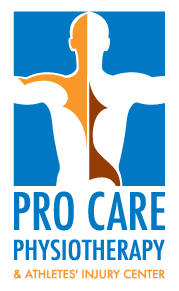 Pro Care Physiotherapy sometimes recommends physiotherapy products to our patients, however, only when necessary. We do not recommend buying athletic tape or any other rehab products without first consulting a member of our staff. The inaccurate application of athletic tape may cause further pain or injury. To find out if you can benefit from athletic taping, speak to your therapist at your next appointment or contact Pro Care Physiotherapy today.